Here’s how Amazon and online shopping in general could affect brick-and-mortar retail this year, as indicated by new data from Walker Sands Communications. For the last five years, marketing firm Walker Sands Communications has been tracking retail data and producing an annual Future of Retail report to understand how the retail landscape is changing. Now that 2018 is behind us, the latest report from the firm is out, and its findings have some interesting insights on what we can expect in 2019. 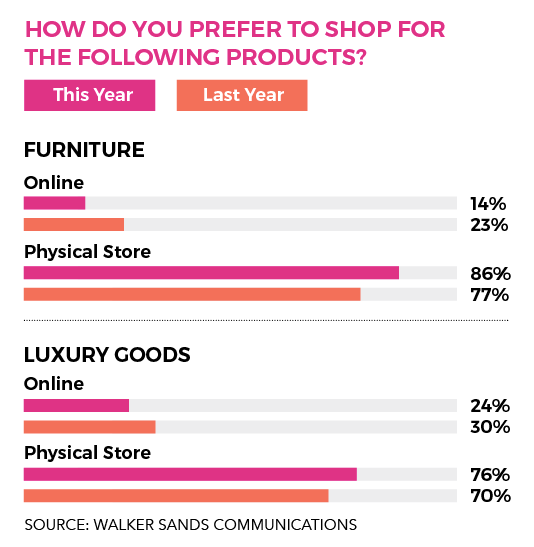 Walker Sands’ findings show that Amazon, more than any other retailer, is setting expectations for online shopping, and they have a loyal consumer base — especially in younger consumers. Here’s how Amazon and online shopping in general could affect brick-and-mortar retail this year. 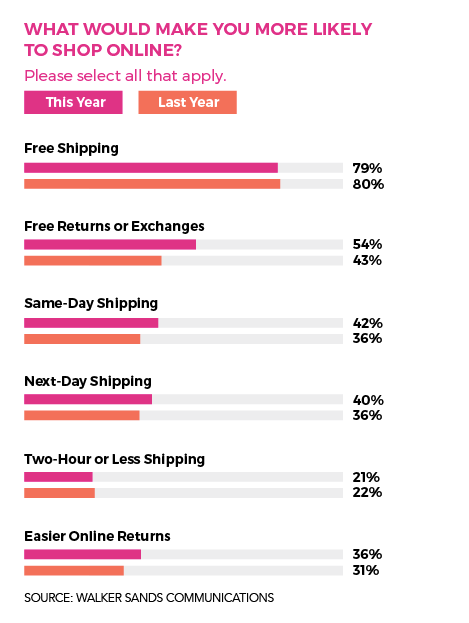 The report notes that consumers no longer consider free shipping a perk. It’s an expectation, especially for Generation Z. Of that generation (ages 24 and below), 54 percent of respondents say same-day shipping is their number one purchase driver, followed by next-day shipping and free returns or exchanges (53 percent). 24 percent of survey takers believe the online experience will never surpass the in-store experience. 18-25-year-olds are among the most likely to make in-store purchases for certain goods. “Ultimately, brick-and-mortar isn’t dead,” the report says, “it’s just changing.” The next generation isn’t ready to abandon brick-and-mortar, but they do have a strong loyalty to Amazon. Though this is all good news for brick-and-mortar retailers right now, Amazon is expanding and investing more in furniture sales. In 2018, the company launched its third private-label furniture collection, offering free shipping and returns within 30 days. As previously noted, free shipping and returns drive online shopping, and Amazon already has a loyal consumer base. 29 percent of consumers are excited about Amazon’s expansion because it provides them more convenient buying experiences. 23 percent are neutral. They don’t care who they buy from; they care about price and convenience. 16 percent are excited about it because it provides them less expensive buying experiences. 42 percent receive one to two packages from Amazon per week. 50 percent of consumers ages 18-25, and 57 percent of consumers ages 26-35 receive one to two packages from Amazon per week. With its private labels and loyal buyers, Amazon could be poised to change consumer minds about buying furniture online. 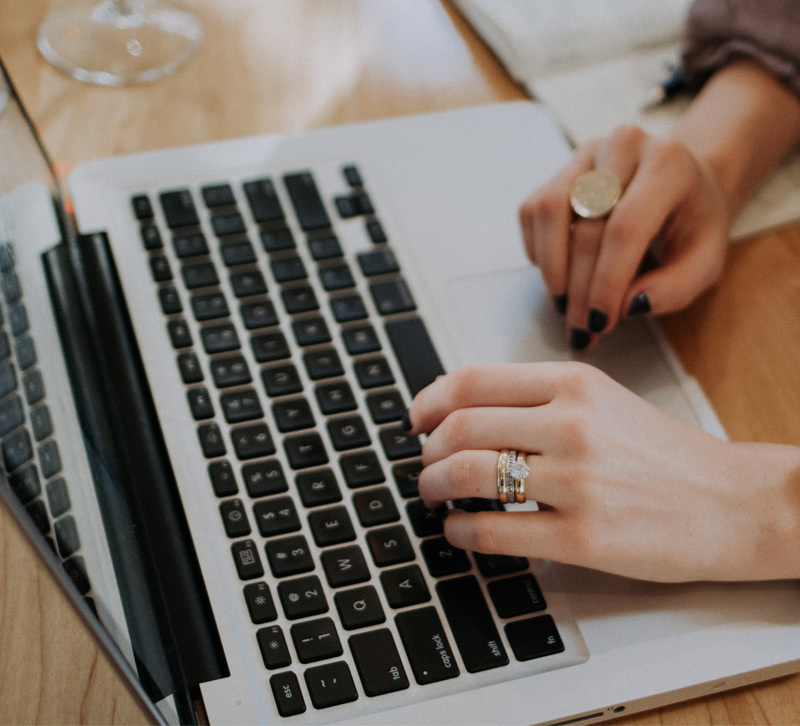 Only time will tell if this will play out, but in the meantime, brick-and-mortar retailers should be wasting no time building well-designed websites, finding ways to offer quick shipping and creating an omnichannel experience for customers.